60 MPH Sunset I finished the quilt. So I did the unthinkable, gasp, I took a photo from a moving car. In fact I took several photos. After I downloaded to my computer, surprise, my phone took better photos than I expected. Several in particular I really liked, of a row of popular trees lining the highway silhouetted by the sunset. The minute I saw those photos, the first thing that popped into my mind was AN ART QUILT!!! . As many people around the Portland area are aware, the MQX West show opened this week. It was everything I had hoped for and then some. I am sharing my impressions and photos of some of my favorite quilts. Two installments to cover it all. Would you like to spend some time with Ann Johnston? Lisa has described her work in this way,“I design and create vivid geometric abstract contemporary quilts. 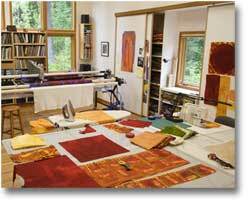 Some people call these things art quilts, or studio quilts, or fiber art, or studio art quilts or any number of other terms. I prefer the term “quilts” but it conjures up images of our grandmother’s quilts.